SINGAPORE - Candidates in the general election held last month spent more than $7.1 million altogether, according to expenses submitted to the Elections Department. The People's Action Party (PAP) candidates spent $5.3 million on the 89 seats it contested while the expenses of the eight opposition parties contesting these seats totalled $1.8 million. In all, spending in this election was about 30 per cent more than the $5.5 million in the 2011 polls. Still, the average spending per voter was below the maximum $4 that candidates were allowed, a sum that was raised this year from $3.50 in 2011. Some candidates opted to make their flyers and manifestos stand out. Fengshan SMC MP Cheryl Chan hired indie graphic design firm Sarah and Schooling to produce her manifesto, as well as her polling and calling cards. She spent a total of $3,050 on them,after discounts ranging between 60 per cent and 70 per cent. 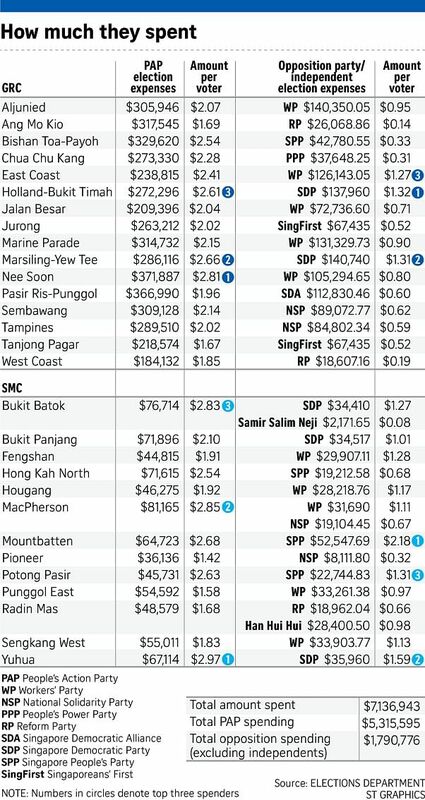 In Punggol East SMC, MP Charles Chong forked out $1,444.50 to print 18,000 "rebuttal flyers" that were probably on the disagreements between the PAP and the Workers' Party about the state of Punggol East's financial accounts. The Sept 11 GE saw two independent candidates. They spent a total of $30,572, excluding the election deposits they lost for failing to secure at least 12.5 per cent of the vote in their constituency. The money went to 50 campaign posters, 3,000 postcards, photo prints, and petrol. People can inspect the candidates' expenses at the Elections Department for a period of six months, starting Wednesday. They have to pay $2 for every candidate whose expenses they want to see.